GAERNE IS PROUD TO REPORT THAT MAGAZINES WORLD WIDE HAVE PUT OUR SG-12 THROUGH RIGORUS TESTS AND CAME BACK WITH 5 STAR REVIEWS CLAIMING IT THE MOST DURABLE, COMFORTABLE AND SUPPORTIVE BOOT MADE TO DATE. New look Introducing the all new SG-12 from Gaerne. The best off road motorcycle boot on the planet!! 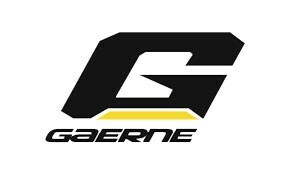 The Gaerne Sg-12 features a new "G" for an exciting first impression. Don't think we stopped there, that is just the beginning. Check out the new features-- *Dual Stage Pivot System--This revolutionary new system is patented and exclusive to Gaerne and is certainly going to be a hit. The first pivot is attached to the "Razorback". This provides a rigid component that offers a strong lateral support while a glide-plate keeps the upper in a firm and upright position. The second pivot is fixed on a sliding glide that allows the riders foot to feel natural while on the peg in a shifting or breaking situation--However, it will "bottom out" and absorb shock in the case of over-jumping a jump or in the case of unwanted compression. *Grip Guard--On the inner side of the boot is the all new rubber "Grip Guard". You can feel the exceptional grip of the bike, as well as offering a heat resistant padding against your inner leg. *Front Plate/Shin Guard--This new Thermoplastic shin plate is anatomically shaped for a perfect fit. By removing three screws a rider can also make the opening wider to accommodate a bigger leg or knee-brace. *Buckle system--The SG-12 utilizes four lightweight alloy buckles that attach to an adjustable strap. This is a "Tried and True" system that provides the rider "Easy in" and "Easy out" non failure system. Keeping it simple! *Gaiter--Made of a new Swiss breathable fabric called Acronos, the gaiter is extremely stretchy but has the perfect shape to keep the sand and debris out. Interior Lining--On the inside you will find the famous "Gaerne Memory Cell Foam" --Known for the most comfortable feel and fit ride after ride. *Heel Cup--The new Heel cup has been designed to absorb shock in the case of a rear compression--It also doubles as a nice place to showcase the new "G" logo !! *Toe-Box--This new design features a slimmer shape in the toe area for an improved feel of the shift lever and the bikes controls. The entire area is wrapped by a new plastic material which is lighter and provides more comfort and feel for the bike as well. *Toe cap--The all new shape --the toecap has been re-designed and reinforced to provide a new "tougher" look. *Sole- For the SG-12 you will notice a new design. This sole is new in look, but still uses the Gaerne "Dual Composite" anti-shock rubber that has made Gaerne soles famous around the world. Insole--Inside the boot you will find an all new foot-bed which has been specially molded to correctly support the foot. In the rear portion of the foot-bed, a new shock absorbing material has been used. And in the front portion the construction has been made to allow the foot to vent.